It has been 20 years since The War, and Major John Karnage has finally settled into retirement: locked up in an insane asylum, with an explosive device embedded in the back of his neck to curb his violent tendencies. Karnage and his troopers have been deemed unfit to live in normal society. Like a bit of old chewing gum stuck under a coffee table, the world has left The War and its scarred, unstable veterans behind. The military has been disbanded and World Peace has descended upon the Earth. Its inhabitants live happy, profitable lives under the global rule of the benevolent Dabney Corporation. All is tea and roses in this new, sanitized world. 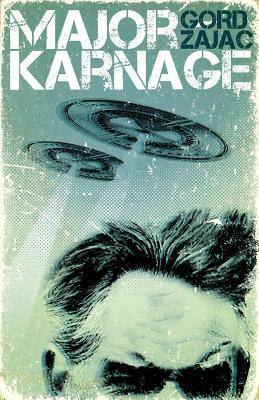 Until a terrifying threat from beyond the stars rears its squiggly head An invading armada of aliens threatens to destroy the Earth, and it's up to Major Karnage to stop them, as long as he doesn't accidentally blow his own head off first. Most of Gord's previous writing experience has been in television, but please don't hold that against him. He has written for The Grim Adventures of Billy and Mandy and Evil Con Carne. He is the prolific author of one short story, one half of a novella, and this book. He lives in Halton Hills with his wife, Alicia Land.